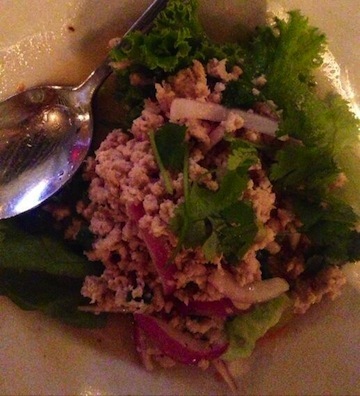 Beau Thai | Gluten Free D.C.
What I got: Larb Gai, minced chicken seasoned with spicy Thai dressing, is the perfect appetizer (pictured below). For dinner I had drunken noodles (wide rice noodle stir-fried with Thai chili, garlic and basil leaves). Gluten-free friendliness: Thai food generally has plenty of gluten-free options, and Beau Thai was no exception. NOTE: the Pad Thai dish has small pieces of tofu that are NOT gluten-free, an ingredient that is failed to be included in the menu description. If you’re not interested in a noodle-based dish, there are a lot of meat and fish options on the menu. Don’t worry, vegetarians, there is a sauteed vegetable dish just for you. 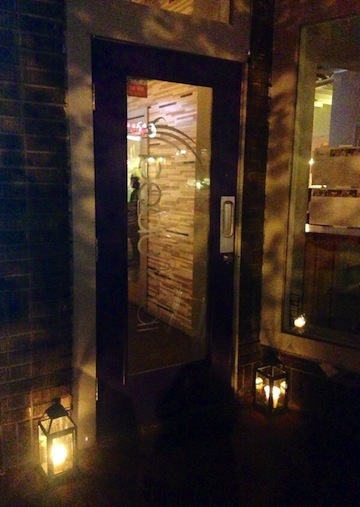 Overall vibe: Beau Thai has a fresh, clean and modern feel. The tables are packed tightly together but for good reason: the restaurant was hopping. (The place was so popular, in fact, that they ran out of the mouth-watering dessert that I was craving since the moment I sat down.) Affordable and delicious, the restaurant is a nice place for a date or a meal out with friends. This entry was posted in Mount Pleasant, Shaw and tagged Gluten-free diet, Gluten-free food, Gluten-free foods, GlutenFreeDC, Mount Pleasant, Shaw, Thai, WashingtonDC. Bookmark the permalink. Hey! Thanks for the post. Do they use gluten free soy sauce and/or cook GF food in separate skillets?